Lore: The Yari are made up of mercenaries from all over Balor. They are gifted warriors that function like an army for hire. They have no defined “home”, so the Yari do not fight for pride of country, but for some material reward. The Yari Alignment very much reminds me of the Spartan Warriors of Ancient Greece in how they function together as a unit. 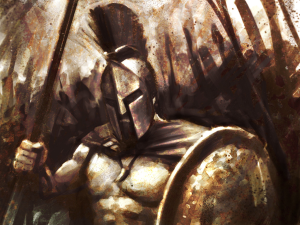 Specializing in attack, as well as protection of their fellow brother in arms. They are unique in that they are a Class Alignment which is available to Human and Shadow Factions allowing for some very diverse builds due to faction card pools. This guide is an evolving article which will change periodically, depending on balancing card changes or a change in my thought process after playing more with the cards. Special thanks, as always, to Gondorian and TJ Starval for input! Notes: Bladedancer is an all around great ally. He has nice aggressive stats which you would like to see in a Warrior Ally. He has an interesting ability allowing to buff another ally with his attack creating 1 super strike attack from 1 ally vs multiple attacks from 2 allies. This is useful in that a singular attack can allow a kill shot or prevent retaliation damage to multiple sources. Bladedancer is a very splash able ally in any Warrior build and also combos very well with attack boosters, other haste allies, other double strike allies, and gobbler allies (Arachnid, Ogloth, etc). Without other allies to use ability on he is a vanilla 2/3 ally. Notes: Spearman is an excellent ally. He provides a nice 3cc protector option that currently does not exist anywhere else. These guys force themselves to the front of the line to protect their friends making them great options both inside and outside of the Yari Alignment. The buff bonuses are also interesting as generally one might not play multiple protectors at the same time but the bonus health (and attack) is really nice built in synergy to make it worth it at times. 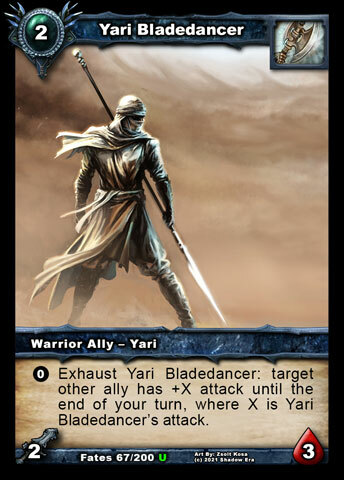 He is excellent Turn 3 play to protect your Bladedancer or just to absorb some damage because your opponent will not want you to lock away your other Yari threats. Notes: Vanguard is the strongest 3cc ally to date when looking at stats alone. Having both offensive and defensive stats allows him to be played at any time and be impactful to the board. While he does not help any of the other Yari, he acts more like a tank and his brothers in fact assist him in becoming even stronger. He has limiting splash capabilities needing to be on his own in order to be most impactful so possibly in an ally lite build. 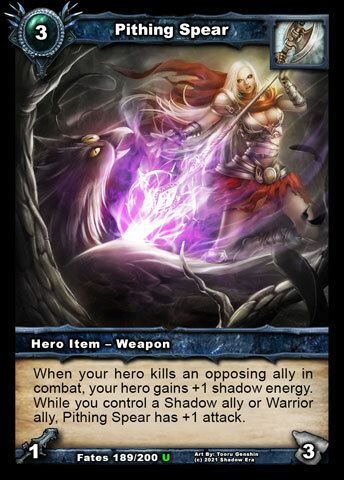 Vanguard is a good tech Warrior splash ally if you expect to run into Hunters and/or Priests. Steadfast breaks Snare Trap and is immune to Retreat/Banish which can be very helpful for Shadow Warriors who do not have access to Spirit Warden. 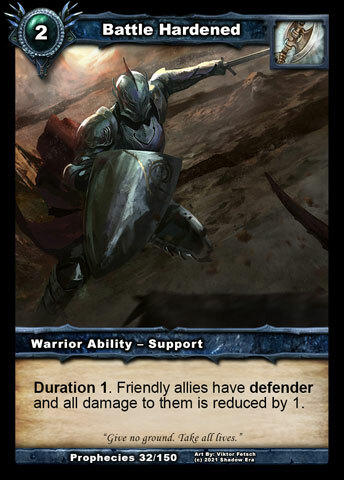 Vanguard can still play effectively with non-Yari cards such as Aldon where loss of value is minimal or in combination play with other more threatening allies. 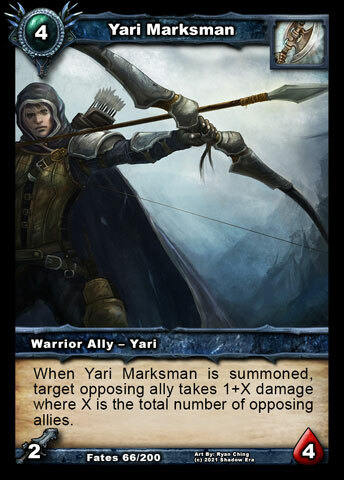 Notes: Marksman is the odd man out in terms of meshing well with other Yari. Essentially he has singular strike capabilities to kill an opposing ally as long as they have 3 or more allies in play. The flavor (insta-kill) and aggressive stats are really the tying Yari bonds. 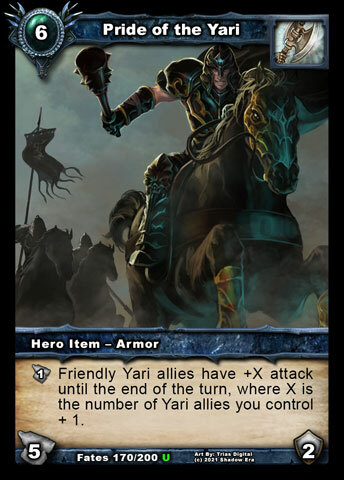 Not having a Yari restriction he is a very splashable ally often seen in Warrior builds, especially those with complimenting Crippling Blows and disabling effects forcing opponent into putting the numbers on the board. Yari Plunderer – 4cc Warrior Ally – Yari – 3sword/5HP – When Yari Plunderer is summoned while you don’t control a weapon, target weapon in a graveyard is returned to play under your control with 1 durability. Notes: Xander boosts friendly Yari both offensively and defensively and at a more affordable cost than The King’s Pride allowing similar effects at earlier turns in the game. Aside from his powerful ability Xander has very strong base stat totals not shared by many 5cc allies (Knight of Golden Dawn = Priest; Crystal Titan = Elemental; Brutal Minotaur = Shadow) making him a potential splash ally in his own right. 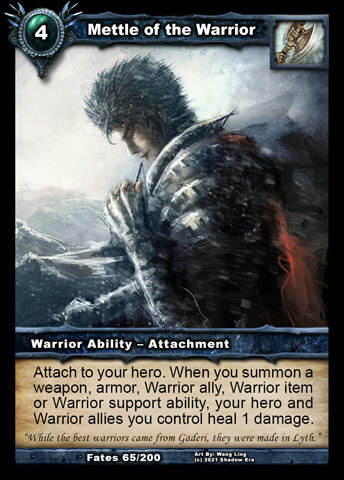 Since he is restricted to Warrior builds only, it is still likely you might see a few other Yari present in the deck to gain even a small benefit from his ability. Notes: Pride of the Yari is quite an interesting a different armor when compared to The King’s Pride. 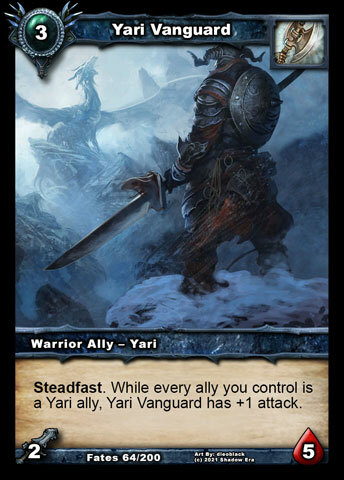 By simply having 1 ally on the board you get the same +2 attack boost, however if you drop this with more allies on the board you gain attack boost at an accelerated rate, because there may be other Yari allies that are also boosting attack due to their built in attack boosts. This armor is a game finisher and well worth playing in lieu of The King’s Pride in most Yari builds. 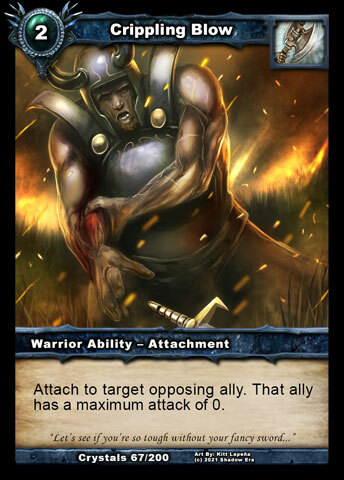 Warriors have access to one of the best draw engines in the game, Blood Frenzy. Being able to draw 2 cards a turn without loosing much tempo except for set up is really powerful. If playing a Turn 3 setup generally means that Bladedancer is not as effective and is essentially Puwen and not likely to continue to remain of the board. The Turn 3 setup however does play favorably into getting to the 3 allies on opponents board requirement for Marksman. 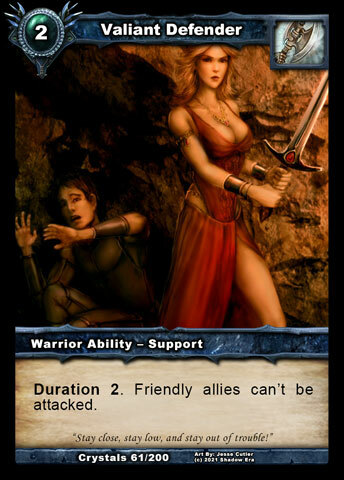 Warriors also have access to a variety of healing options to offset the damage received over time. Crippling Blow and Ellos’ Resolve are two attachments that really synergize well with the Yari theme. Crippling Blow represents neutralizing the enemy while also helping to get board counts up to requirement for Marksman. Crippling Blow can be a great alternative to a Turn 2 Bladedancer if planning on playing Blood Frenzy on Turn 3. Ellos’ Resolve has Yari synergies written all over it, increased attack, health and reduced combat damage. Healing is not something that Warriors specifically need but I would still like to talk about Mettle of the Warrior. 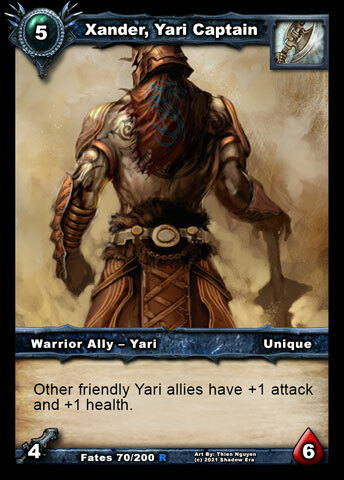 Mettle of the Warrior has increased value in a Yari build as they are Warrior cards and trigger the healing along with other Warrior cards probably in your deck. This is different in that it can heal allies as well as your hero and is not as much of a dead draw against ally lite builds like Rampage is. Vess most likely will get best benefit from this attachment as she can play it early enough and get most healing value without losing much tempo. Battle Hardened and Valiant Defender are really only listed here because they will synergize very well with the Yari theme of boosting attack and protection. While the support cards are not currently very playable these should be things to look out for in future expansions. 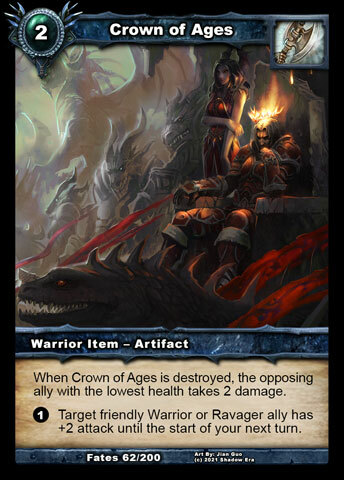 Crown of Ages is a card that emulates the attack boost flavor of the Yari. It has a activation cost associated with gaining the attack boost well worth the cost on a reusable artifact. This attack boost combos well with Bladedancer’s transferable attack and also separately with Defender since the boost last until start of your next turn. Crown also has a built in damage feature to opposing allies granting some additional uses if destroyed by any player. Ter Adun can make best use of this particular artifact. 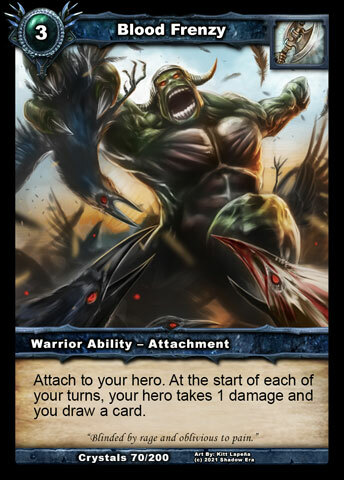 Pithing Spear attack bonus triggers off of Warrior allies so this becomes a primary weapon option for Logan and Rothem Yari decks. At times it can reduce the value of Marksman somewhat in that you are killing the opposing allies instead of locking them in play. 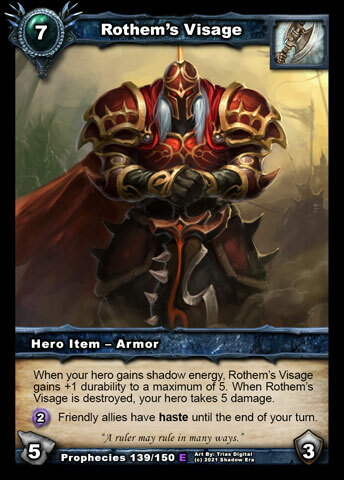 Rothem’s Visage most Warrior decks need their abilities consistently, except for Ter Adun. When Crown isn’t available or needed to be destroyed, Visage is a great SE dump for Ter Adun to use. With Bladedancer and Crown in play, any ally can potentially have a huge amount of attack points being hasted in. Also Yari overall have fairly good cost to attack ratios. Boris Skullcrusher: There are a lot of builds who tend to stay away from fatties which makes Boris an excellent choice for use with the Yari as his ability can be useful for the entire game. His ability comes in time with a potential setup of Crippling Blow, Blood Frenzy, Marksman minimizing tempo loss on the board. Boris has lots of board swing potential so he is never really out of the fight. Amber Rain: Amber provides a dual use build so you can have a slightly varied play style. I like the Jeweler’s Dream swarm approach because if you can flood the board with a lot of aggressive allies and have them stick it is usually going to be a bad day for your opponent. Also with weapons sometimes you can force opponent to try beat down tactics allowing you to go more at hero while opponent floods board and get to Marksman requirements. Tala Pureheart: So far in my testing Tala has the most mixing of Yari + other allies. Spearman is not as effective with Tala as there is too much overlapping of protector so you can get some utility allies in the build instead (FFM, Seductress, etc). Tala would benefit from a new Yari ally that either provides some sort of protection or a card that allows an ally to gain Yari Alignment. Ter Adun: Ter Adun was quite interesting during my brief play testing. There are lots of neat and interesting synergies but mostly combo related stuff. Early Bladedancer + Rampant Krygon is very strong opening and Shadow Knights is great for recycling key allies (SK, Spearman, RK, and Marksman). Crown of Ages is an emulated version of Bladedancer with some on destruction effects that Ter Adun can utilize if needed. Late game Rothem’s Visage is excellent. Most likely your opponent did not play with as many items/support abilities for you to use his ability on so you can use the haste SE outlet for a strong late game push. Most of the allies are fairly aggressive so you can get some big damage swings. Logan Stonebreaker: Quite interesting to play and surprisingly decent. 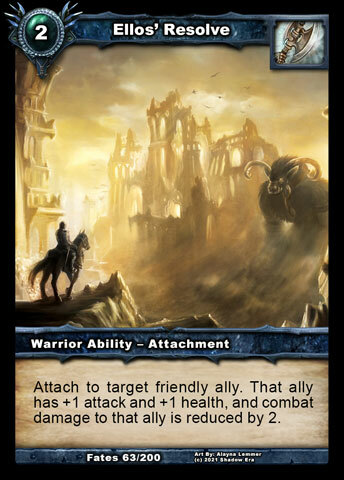 My splash allies to assist with the build are Frostmare and Shadow Knights. Unlike with Ter Adun who uses Rampant Krygon as the assisted haste damage, I opted for the lower “Free” cost Frostmare so that I can combo with Pithing Spear much easier, though the combo with Bladedancer is not as strong. I also opted to promote a swarm approach to the deck so I complimented with Jewelers Dream and Shadow Knights as well as a few other draw cards. 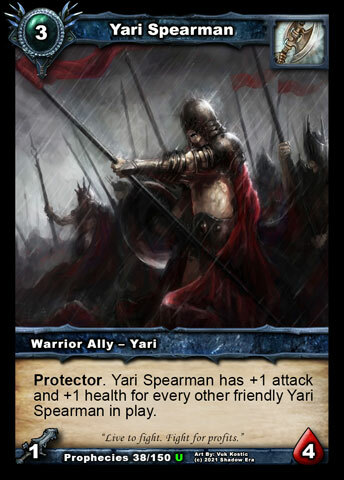 The Yari themselves are pretty strong and threatening and a nice compliment to Logan’s ability helping to keep opponents focused on the board. Marksman loses value with Logan because he is harder to combo with the Hero ability unless you have 7+ resources and Logan is always looking to keep the board clear despite Crippling Blows. Also Xander is only 2 copies because of Unique. I want to have as many playable allies as possible to assist with swarming. Note the deck shown is not teched. Vess Swifthands: Currently Warriors have a plethora of useful attachments making Vess an excellent choice for use with the Yari. Her ability allows an early tempo setup of both board (Bladedancer + Turn 3 ally) and draw (Blood Frenzy + Confluence of Fate options) allowing her to be aggressive and not let up. Additionally she is the one Warrior who could add Will to Fight to her build allowing Marksman to be an extremely effective target in the right conditions. Vess also has the most efficient way of including Warrior Healing attachments or Rampage, Enrage and/or Mettle of the Warrior not saying she needs them though. Tagged alignment, lost lands, Shadow era, shattered fates, tribe, warrior, Yari. When Lost lands will be released? Well I do not know when LL will be released (you’ll need to ask a Wulven Rep), but I will guess that it will be sometime after WC (currently ongoing) is completed and also when all of the art is done for cards being released in Set 1.